A few weeks ago we were lucky to receive a serious amount of free cheese from Ile de France. You’ve most likely seen their brie, goat cheese or St. André (which I could rub all over my body it’s that good) in your supermarket but they have so much more to offer. I only wish my grocery store carried all their cheeses. They also just redid their website and it’s an excellent way to get over 500 cheese recipes or just peruse the various cheeses they offer. After chomping down on the many cheese samples Ile de France mailed us (a vast variety including Chaumes, St. Albray, Goat and Brie) , we had alot left over. We’re kinda cheese fiends and when we’re feeling in the mood to eat cheese, we’ll go to our local shop and go a bit overboard. The cheese drawer will pile up until I can barely close it. This is never a good thing. Weeks later I’ll check out what’s at the bottom of the drawer to find shriveled bits of piave, way over-ripe, acidic smelling camembert or moldy tomme. I’ll often chop off mold or use the shriveled bitsto grate as pasta toppings, but often I’ll say a prayer, shed a tear and throw them into the garbage. It burns a hole in my heart every time! But this time I just couldn’t see all that cheese go to waste, even if much of it was free. What about all the starving kids in China (Will that one work on my future child? Sure as hell didn’t work on me!)?! So I scratched my head and thought about what I could do. Mac and Cheese? No. Cheese Log? It ain’t Christmas. Mixed Cheese Tart? But I’ll have to use my oven and it’s so damn hot! Ok, let’s to a cheese tart. I am very glad I did and I highly reccommend you doing the same with all your leftover chese bits. Hard cheese, soft cheese, triple creams, stinky cheese – they’ll all go great in a cheese tart. Not to mention you won’t have to worry anymore about the starving kids in China. Make your pastry by hand or in the food processor, chill for 1 hour then roll out to about 1/4 inch thickness and fit it into an ungreased pie mold or 9-inch springform pan (which is what we used). Blind bake for 12 minutes at 400 degrees. Make your filling, starting with melting the butter slowly in a pan then whisking in the flour. Continuing to whisk, add the milk slowly and combine, stirring constantly until the mixture is thick. Take off heat. Add the cheese and heavy cream. Whisk. Add the beaten eggs, salt and pepper and chives. Whisk. Add your optional tomato slices to the bottom of your blind baked pastry, overlapping in places to try and cover as much of the bottom as necessary. Pour the filling into the pie pan, leaving a bit of room to grow at the top (don’t overfill). You may have more filling than necessary. 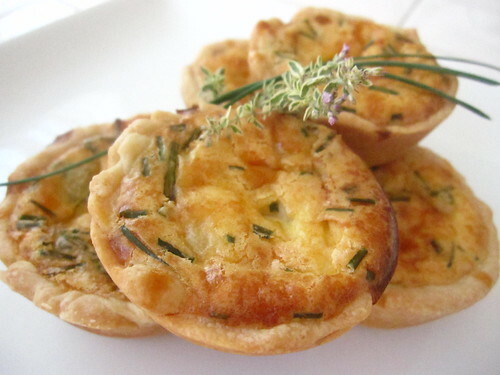 In fact, we had a bit extra pastry and filling, we ended up making a few small tarts using a muffin tin. Optional: beat an egg and brush on the outside crust of the pastry so it won’t burn. 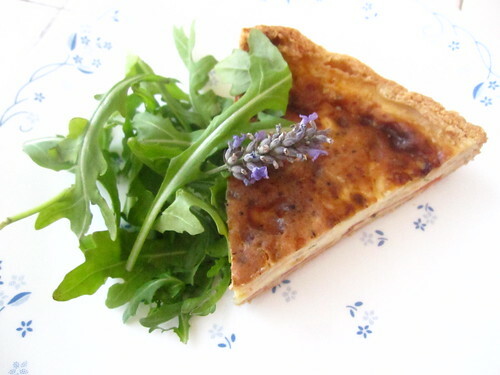 Put back in the 400 degree oven and bake tart for 45 minutes to 1 hour (until it is no longer wet in the middle and has browned on the top – use a knife or a skewer to test that the middle of tart is done). Depending on how much filling you use, eyeball the cooking time, may need a bit more, may need a bit less. This is perfect, I always have bits of this and that kind of cheese in my fridge. 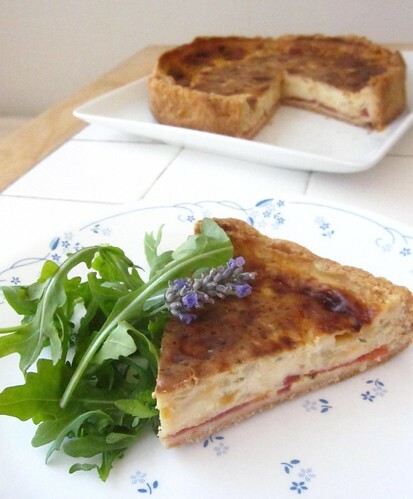 A cheese tart sounds positively scrumptious! Ach, I started getting their samples right after I found out I was pregnant, and I didn’t want stinky French cheese! And I didn’t want to blog about it! So they stopped sending it to me. I really should get back in their good graces. I miss them. I love your tart, btw. I’d add some mushrooms, but that’s the only way I know. That looks familiar…… yes, Amy, you are right, even I could make that! Hey – congrats guys on becoming parents! That’s one lucky kid who’s going to be culinary expert by the time they go to kindergarden with all the scrumptious edibles you conjure up! Cheese tart looks amazing and the layer of tomatoes is the perfect touch. I’m with you…don’t waste any cheese. This is a great idea. CONGRATULATIONS guys! That’s so very exciting! Crikey, you’re going to have one of the best fed children in America. What wonderful news, guys!! I feel the same way about cheese…it physically pains me to throw it out, so a lot of strange cheese laden concoctions get made when the fridge starts to get a bit ripe. I have learned that there are times when you just *should not* use gorgonzola, and I learned it the hard way. And now I’m thinking of, craving, and dreaming about cheese again. Sigh. It’s going to be a long, calorie laden day. What’s this ‘leftover cheese’ you speak of? I’m unfamiliar with the concept. Somebody told me about ‘leftover wine’ the other day, which left me similarly baffled. A cheese worthy to be rubbed all over the body! Now that’s some high quality cheese! I can almost imagine the sharp taste and light texture of the cheese just from looking at that tart. Nice job and spectacular photo! Looks pretty delicious. Very wise use of the leftovers. Of course Mac and Cheese is a wise use too – and kids are supposed to love it (I didn’t love it as a kid, but I was weird – still am and i like M&C now). Nice way to slip in teh good news BTW. Congrats. Free cheese? How come I’m never offered freebies like that? 😉 We have the same problem with over-stocking our fridge with cheese, so I know what you mean about saying a little prayer and tossing a bit into the trash! Is the last picture of mini tarts? What kind of pan did you use for them? Muffin pan? @cateringBerlin – thanks so much for the comment! It’s awesome that you made it! We love to get feedback when our recipes have been successful! Great idea, the photo is so pretty too. And last but not least, Congratulations! You haven’t had the baby yet? I came all the way over here (uphill both ways) and all I get is leftover cheese tarts. You should make a t-shirt that says that. With China’s growing prosperity, kids haven’t starved in China IN DECADES. This is a rather unpleasant and outdated stereotype that some might allege to be racist. In this country alone, due to problems with welfare abuse, waste, and lack of accountability, some 500,000 American children go to bed hungry each night. It might be more accurate to talk about starving children in American ghettos than to talk about children in China.